Previously we saw that there are two important classes of nucleophilic substitution reactions, which differ in their rate laws, dependence on substitution pattern, and the stereochemistry of the products. Having gone through the SN2 mechanism, today we’ll circle back and look at the second important mechanism for substitution reactions. It’s called the SN1 mechanism. Let’s look at what the data tells us first. If we start with an enantiomerically pure product, (that is, one enantiomer), these reactions tend to result in a mixture of products where the stereochemistry is the same as the starting material (retention) or opposite (inversion). In other words, some degree of racemization will take place. Compare this to the SN2, which always results in inversion of stereochemistry! Clearly something different must be going on here. We can also measure the rate law of these reactions. When we do so, we notice that the rate is only dependent on the concentration of the substrate, but not on the concentration of nucleophile. Weird. Remember that the SN2 depends on both. Why might this reaction only depend on the concentration of substrate? When we subtly change the types of substrates (e.g. 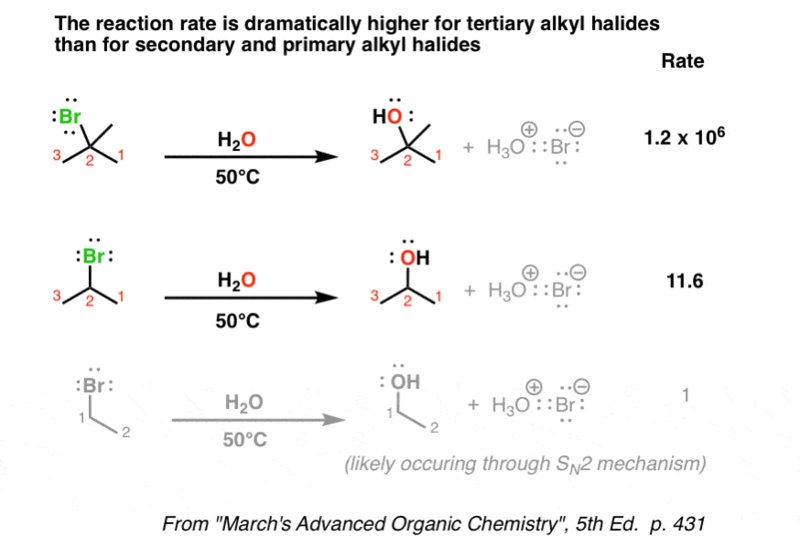 alkyl halides) we use in these reactions, we find that tertiary substrates (for instance, t-butyl bromide) are considerably faster than secondary alkyl bromides, which are in turn faster than primary*. Compare that to the case for SN2, where primary was faster than secondary and tertiary hardly reacted at all. Mysterious! The best hypothesis we have for this reaction is the stepwise mechanism. In the first step, the leaving group leaves, forming a carbocation. In the second, a nucleophile attacks the carbocation, forming the product. This explains all of our observations nicely. 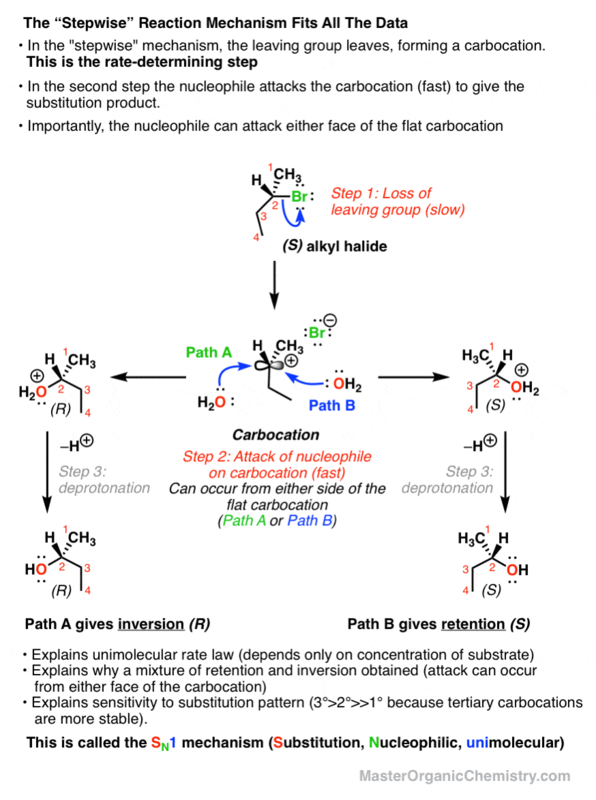 First of all, the slow step should be formation of the (unstable) carbocation – which only depends on the substrate, not the nucleophile. Furthermore, since the stability of carbocations depends tremendously on substitution pattern (tertiary carbocations are more stable than secondary, which are more stable than primary) this also conveniently explains the dependence of the reaction rate on substitution pattern. Any factor which stabilizes the carbocation, increases the rate at which the leaving group can leave. It also helps us understand the stereochemistry. Since the nucleophile is flat, attack could occur from either face; which means that we obtain a mixture of retention and inversion products. This is therefore called the SN1 mechanism – Substitution, Nucleophilic, Unimolecular – to contrast with the SN2 (Substitution, Nucleophilic, Bimolecular). It all seems to work if you’ve got a good leaving group present (like a halogen). But what if you don’t have a good leaving group? In the next post we’ll talk about how to make a poor leaving group into a good one. *Note – the primary alkyl halide shown here is certainly reacting solely through an SN2 mechanism. Final note – although it’s often said that the SN1 proceeds with “racemization” of stereocenters, in practice a 50/50 split of stereocenters may not be obtained due to “ion pairing” effects. 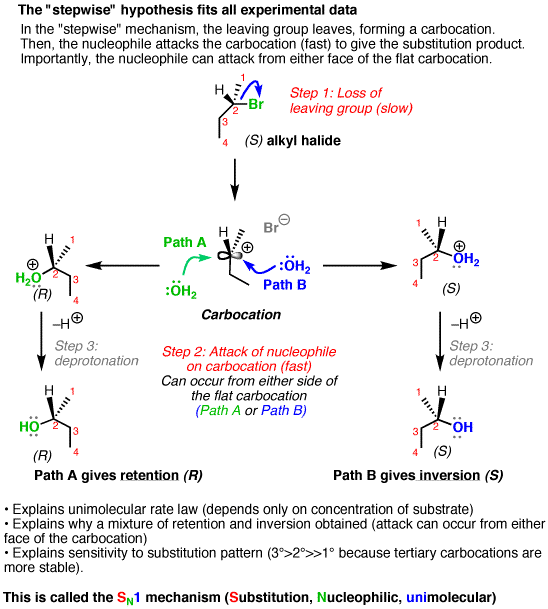 In other words, the leaving group could leave, but not fully dissociate from the vicinity of the carbocation, which could block a nucleophile from attacking the nucleophile from that face. For that reason it’s a little bit more correct to say that it proceeds with a “mixture of retention and inversion” rather than “racemization”. Tremendously useful site, your efforts are highly appreciative, Kindly correct the spelling of Carbocation in the fourth line after mechanism. 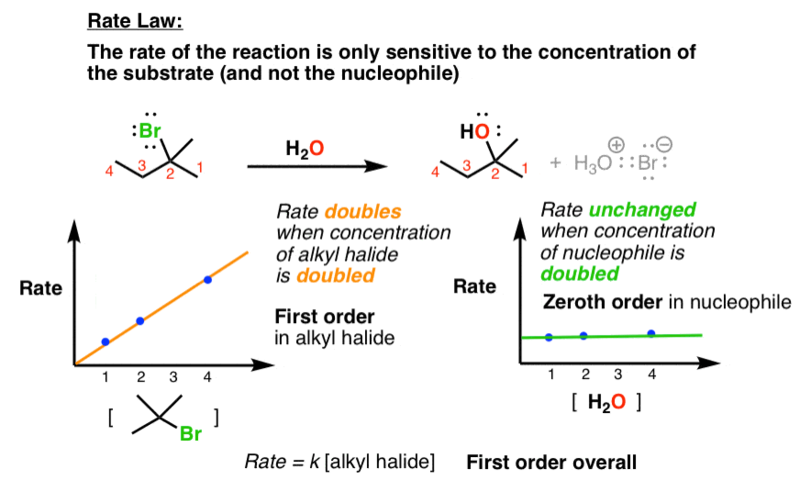 Anyway, just wanted to point out that on your starred note at the bottom, I think you meant that the primary alkyl halide is certainly reacting through an SN2 mechanism (not an SN1). Yes, you’re right. Thanks for the catch – and glad you find it useful! EXTREMELY helpful! The content is very straightforward and understandable! MUCH appreciated! This website will be used for the whole semester!! In the paragraph under “final note”, I believe “In other words, the leaving group could leave, but not fully dissociate from the vicinity of the carbocation, which could block a nucleophile from attacking the nucleophile from that face” should read “block a nucleophile from attacking the electrophile” instead.Also,In the paragraph under “So what could be going on here?”, I believe “Since the nucleophile is flat, attack could occur from either face; which means that we obtain a mixture of retention and inversion products” should read “Since the electrophile is flat” instead.